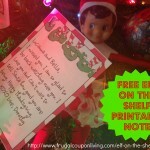 Have you paid close attention to our Elf on the Shelf Ideas found on Frugal Coupon Living. Dozens of ideas and so many more to come! Looking to get creative with your Elf on the Shelf Photos, want your special guy or gal to bend, hang, hug, groove, jig or more. Insert craft wire into his limbs in this DIY (Do It Yourself) Step by Step Tutorial. 1.) First, the thicker the better but you want to make sure you can easily cut it and slip it through the seam of the elf. 2.) Lift up the arm pit and slide about three inches of wire into the elf’s arm. Adjust as needed. I folded my wire to thicken it. 3.) Trim excess wire. Repeat under the second arm pit. 4.) Most Elf on the Shelf dolls have a seam at the knee so you will need to have a lower and upper wire (calf and quad) in each leg. 5.) Go behind the Elf’s bottom, slide in a new wire. This one will only be around an inch and a half as you are only going the length of the quad. Repeat behind the second leg. 6.) Slide a new wire into the toe seam to the knee. This is about an inch in length. 7.) Trim all excess wire. We love sharing printables! 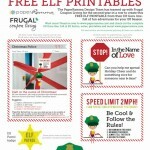 Grab this FREE Elf Twister Printable by Entering Your Email Address Below! I agree to give my name and email for this free content. I agree to give my name and email for Frugal Coupon Living's daily email. 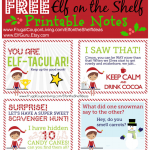 Grab these FREE Elf Printable Notes by Entering Your Email Address Below! Also grab these FREE Elf Costumes and Notes Printables by Entering Your Email Address Below! Love the No Sew Bendable Elf on the Shelf Tutorial? Find plenty of Elf on the Shelf Photo Ideas with more photos coming regularly. Wondering where do you get the Elf? Such a great idea! This is our first year with an elf n the shelf and I’ve been having a heck of a time positioning him! I know – consider thicker wire too. If needed, I sneak in safety pins but I never want the kids to see! How fun! I’ll be sure to share this with my friends doing Elf on a Shelf this year! Thanks for sharing at the Pinworthy Project Party on Planned in Pencil.